When people think of timber harvest, Paul Bunyon in SCUBA gear is not the first image that comes to mind. However, in recent years, some companies have turned their attention toward the bounty of underwater timber that’s been hidden from sight for centuries. These logs may be described as river or lake reclaimed, deadheads, or sinkers. Boards created from sinker logs have gained desirability on the market because of the attractive color variation, durability, and perceived sustainable benefits. How Do Trees Get Underwater? Trees become submerged by slipping from a logger’s grasp or by growing in a valley previously dammed for reservoir construction. The scene under many artificial lakes resembles a watery ghost forest, composed of drowned trees that once stood tall along flowing creek sides or riverbanks. As sinkers are pulled to the surface, so is the history of the logging industry. Some of these trees were a part of virgin forestlands, where they stood for hundreds or even thousands of years, growing to enormous girth and density. Very few of these old growth trees remain legally accessible for harvest today, which makes the sinker logs that much more desirable. In the nineteenth century Pacific Northwest, pioneer loggers faced the challenge of turning massive trees into lumber. Once a tree was cut, a lot of work remained to turn it into a log and then transport it to a sawmill. Oxen were the beasts of burden tasked to move logs from point A to point B along cleared paths, which became impossibly muddy, bogging down animals and cargo. To solve this issue, cross logs were placed perpendicular to the direction of travel and thick black oil helped the trees slide along. These were called skid roads, and expedited the log transport system. If a lumberjack was fired from his job, he was sent walking down the skid road, which is where the term “skid row” originated, a name that prompts an image of unemployment and squalor to this day. As skid roads accelerated log transport, the pioneers also used a method called flashboard damming. This is where a river or creek was temporarily blocked to create a flooded area. Felled timber was dragged to the floodwaters where it would collect and float in mass. Once a sufficient number of timber was collected, the dam broke, and a rush of water and logs careened downstream where they could collect and move via railroad. This method proved to be quicker and cheaper for men and beasts alike. As a result of flashboard damming, many smaller logs embedded in the banks. They remained abandoned and deemed unworthy of the loggers’ time and effort to collect. This created an abundance of woody debris in these waterways. The embedded sinker logs were freely harvested up until the 1990s when overzealous harvest practice drew the attention of regulatory agencies. 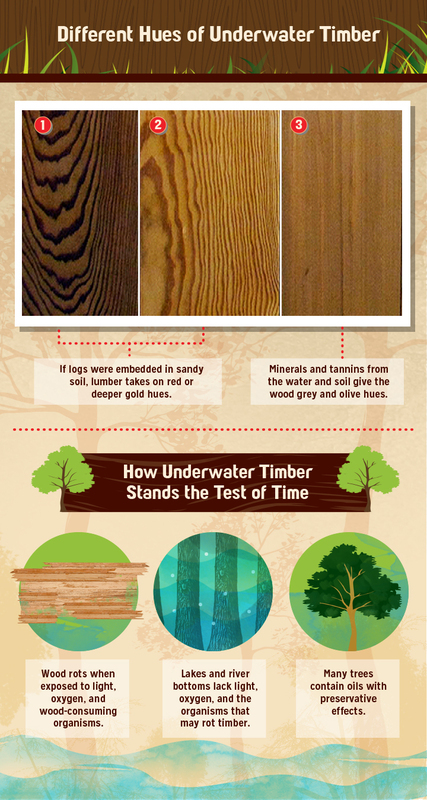 As counterintuitive as it may seem, sinker logs provide excellent quality wood products. Wood rots when exposed to light, oxygen, and wood-consuming organisms—features lake or river bottoms lack. Many trees also contain oils that have preservative effects. When logs lay in muddy substrate for extended periods of time, the wood fiber absorbs the minerals and tannins found in the water and soil, which give the wood its unique hues of grey and olive green. If the logs were embedded in sandy soil, then the lumber may exhibit hues of red or deeper gold. If the logs are from old-growth trees, then the wood grain is extremely dense, which increases durability and works well for flooring, countertops, and siding. There are two types of underwater logs to harvest: the escaped logs from previous operations and the dead trees still rooted to the bottom. Sinker logs are collected, whereas underwater trees still need to be cut down. Each scenario requires different harvest techniques and machinery. Sinker logs are commonly collected by small-time operations, involving a small group of people using machinery to collect one log at a time from a river or reservoir. Divers hook cables to a submerged log, which is brought to the surface with air floats or winches. The logs are then stacked on a barge or towed ashore. A one-man operation in Maine pulls in an average of 15 logs over a 12-hour day. Harvest yields vary depending on distance of travel, log abundance, and weather conditions. Larger companies use advanced machinery, which can cut submerged rooted trees. Some deepwater harvest machines are remotely operated and dive as deep as 100 meters, putting workers at minimal risk of injury. 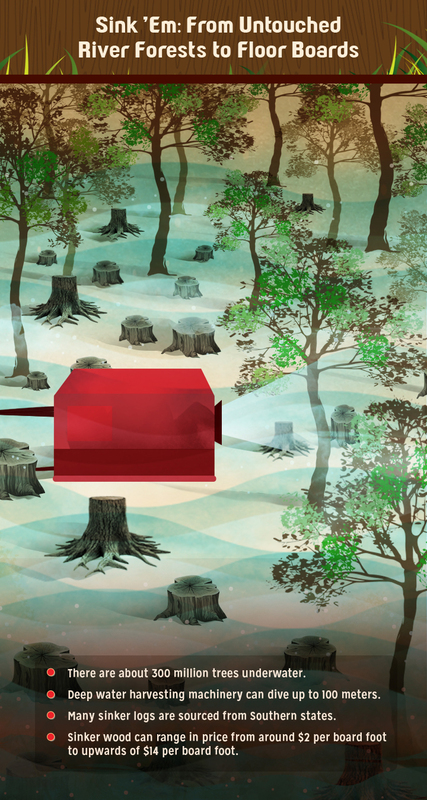 Under good conditions, a deepwater machine can cut one tree every three to five minutes. For shallow water operations, a harvester is operated from a barge, and, with the help of cameras, an automated dynamic positioning system, and wireless controls, the operator can control a telescoping boom arm to harvest underwater trees. These trees are cut and moved by the arm to be stacked on or near the barge before being towed ashore. After the time and effort are put forth to extract the sinker logs, there are additional production costs before the wood is ready to sell. These include storage, mill, transport, and drying. Sinker logs can be sold directly to the consumer, or wholesale to commercial retail. Retail prices for the lumber vary widely depending on the quality grade of wood, wood cut, species used, and transport costs. Many of the sinker logs sold in the U.S. are sourced from the southern states, such as Louisiana or Florida. A cypress puller who intends to sell the wood directly to retail consumers may sell it for an average ofone to four dollars per board foot. Commercial retail prices range from two to five dollars per board foot. By the time high-quality sinker cypress wood reaches a California show room, it can range from eight to fourteen dollars per board foot. Boards cut from recovered logs are touted as sustainable or environmentally friendly, largely because they are not harvested from terrestrial forests. This insinuates terrestrial forestry is unsustainable and pulling logs from aquatic systems is a notch up on the illusive sustainability scale. In reality, there are costs and benefits to each method of timber harvest. One method of harvesting sub-aquatic trees is to pull them up from lake or river bottoms, causing a disturbance of sediment that results in an increase of turbidity. Turbidity is a measure of water clarity calculated by how well light scatters throughout a liquid. High sediment suspension in the water leads to an increase in total suspended solids. When turbidity is increased at an unnatural rate, this creates problems on multiple levels within an ecosystem—blocking light for photosynthetic organisms, smothering egg nests, and inhibiting hunting abilities of aquatic animals, to name a few. Highly specialized underwater harvester machinery reduces this impact by cutting the upright trees rather than pulling them up by their roots. There is also the incentive to reduce turbidity so the underwater cameras are able to function for the operators. Although the harvesters minimize turbidity impacts, there are other impacts to consider such as riparian effects from haul out sites and staging areas, as well as the consequences of removing structures in an aquatic ecosystem that have been in place for decades, sometimes centuries. From the standpoint of steelhead, for example, the sinker log provides an important role in habitat contribution in a river system. Just like terrestrial forests, aquatic habitat can be enhanced with structural diversity. A log wedged into a river bottom provides shelter from the currents. The log changes the flow pattern of the river to create eddies that bring in food and washes away fine silts, allowing formation of gravel beds. These gravel beds are crucial for anadromous fish spawning, allowing a place for eggs and young fry to hatch and develop without immediately getting washed away to sea. Logs in creek systems are significant sources of habitat quality, and when most of these logs are removed from a system, it could have detrimental effects on fish populations, not to mention other countless riverine species and the geomorphology of the river itself. Another way to look at terrestrial timber harvest practices is that the harvest lands are in the business of tree production. Trees are harvested, replanted, and harvested again in calculated cycles. Old growth forests are rarely if ever cut due to environmental regulations that reserve critical habitat for listed species. The timber industry has the practice of logging (now called forestry) down to a very distinct science, and is constantly working with regulatory agencies on environmental impacts at local, state, and federal levels. There are many levels of how “sustainable” a company may be harvesting, from very low habitat consideration (i.e. clear-cut logging) to variable retention harvests (i.e. mixed levels of thinning with the goal of mimicking natural disturbance events). Pulling logs from watersheds will prompt a string of environmental regulations if operations occur within the United States. This is a likely reason underwater logging companies may take their business to places beyond U.S. borders. There are levels of agencies a sub aquatic harvester will work with, from local city or county departments to state and federal agencies. These agencies are responsible for upholding environmental laws and guiding the harvester through the process. In California, the alterations of watershed components triggered a Lake and Streambed Alteration Agreement (LSAA). In 1999, the impacts of removing logs from watersheds were determined to be significant enough to require the applicant to undergo California Environmental Quality Act (CEQA) evaluation. If impacts are determined to have a “substantial adverse affect,” then the project will require an environmental impact report (EIR). The CEQA process is in place to minimize negative environmental consequences by evaluating potential impacts and providing mitigations measures while delivering information to the public. States other than California are subject to federal regulations such as the National Environmental Policy Act (NEPA), Clean Water Act (CWA), and Rivers and Harbors Act. Agencies that oversee these regulations are the Fish and Wildlife Service, U.S. Army Corps of Engineers, and National Marine Fisheries Service. For a summary of the legal processes that involve watershed alterations, check out the Guide to Watershed Project Permitting. The focus is on California, but provides a good review of federal guidelines as well. The science that specifically addresses underwater logging is lacking, meaning the long-term effects on aquatic ecosystems can be hypothesized but not fully understood. To deem one method of timber harvest as more sustainable than another is mainly a marketing strategy, because there is no reliable method currently in place to quantify the concept of sustainability. If there is no way to systematically test an idea, then companies are free to use the rhetoric to their benefit without being required to show evidence. Thus, instead of asking how sustainable a product is, perhaps the consumer should ask different questions that relate specifically to their personal needs or concerns. Danielle started as a field biologist in 2005. 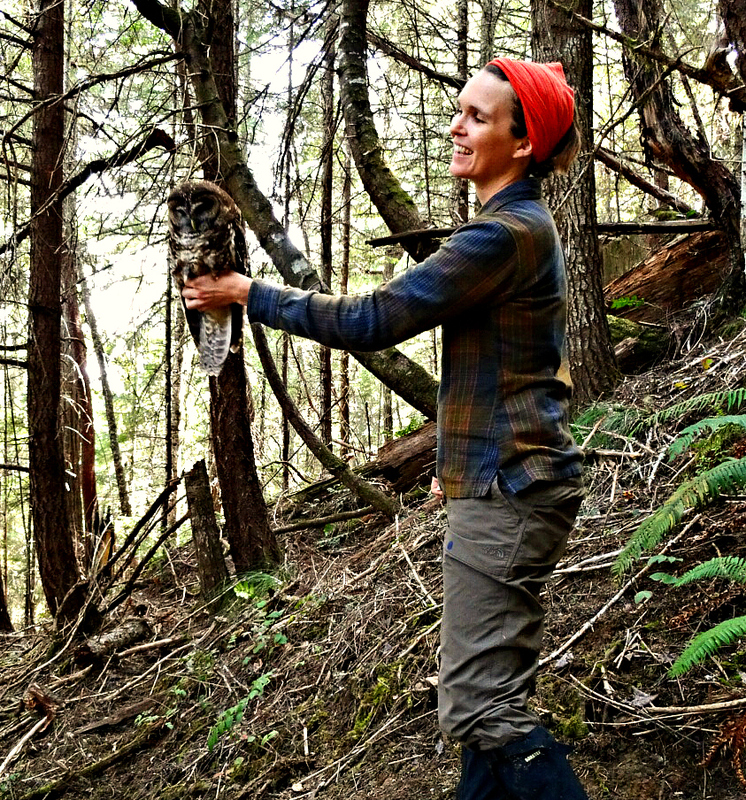 She has worked with conservation research projects involving the Caspian tern, northern spotted owl, and red-crested cardinal in North and South America. She served as a biological consultant conducting botanical inventory, nesting bird surveys, rare species surveys, and habitat restoration. Danielle earned a Bachelor of Science in Ecology and Systematic Biology, and a Master of City and Regional Planning with an emphasis on environmental planning from California Polytechnic State University, San Luis Obispo. Writing about curiosities provides her with the intellectual intrigue similar to that of poking at stuff with a stick. Whatever the topic, if you give it a little nudge, you never know what surprises it may reveal.